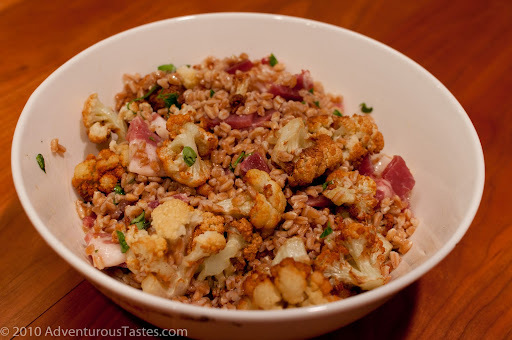 Long ago, I'd found a recipe for Farro Salad with Fried Cauliflower that caught my attention. I honestly didn't know what farro tasted like, but having been obsessed with crispy fried cauliflower served at a little pita shop near my old NY hood, I couldn't resist the siren call of that unheralded veggie. Alas, I couldn't find farro anywhere. So it got filed away in the dark vault of recipes I'll never try, and I forgot about it. That is until I stumbled onto a giant bag of farro at the Brookhaven Costco the other day. That's what passes for excitement for me these days, so suffice it to say I was rather pleased to dust off the languishing recipe and give it a go. Turns out it was worth the wait. Not only is it super easy and quick to make, but it's packed with fresh flavors of herbs and lemon, combined with the al dente chewiness of the farro, the crispy fried perfection of cauliflower and the fatty joys of prosciutto. A veritable taste explosion! 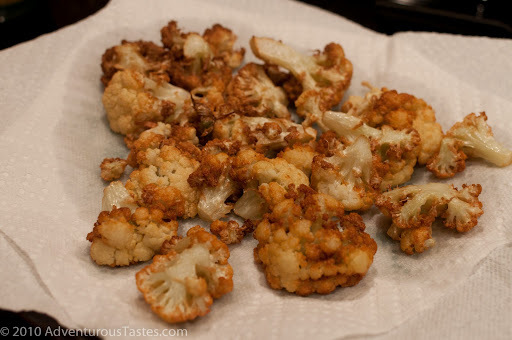 Seriously, though, I loved that it was light but satisfying, and if you aren't familiar with the wonders of fried cauliflower, allow me to introduce you. An otherwise bland veggie becomes a gorgeous melding of golden crunch when introduced to a sizzling pan of oil. It's utterly addictive! And best of all, it held up well the following day and made for great cold leftovers. What more can you ask for?